Swimming is an amazing way to get exercise and get fit. While swimming is amazing for the body, it takes a lot of strength and using muscles you don’t necessarily use every day, as well as relying upon your arm and shoulder strength. Click the picture to learn reasons to swim. As you start to swim, your body has to reteach itself how to breath. You have the weight and pressure of the water against you, you have to hold your breath until you have the opportunity lift your head out of the water and take a usually chlorinated breath, as chlorine will hover about 6 inches above the water. Your breathing muscles get really sore and your diaphragm, muscles between your ribs, and some of your neck muscles can feel strained just from breathing differently. Your shoulders are your powerhouse! You have your rotator cuff, consisting of 4 muscles to rotate the humerus, and your shoulder girdle, consisting of your lats, traps, rhomboids, pecs, and a few other muscles. These muscles need to be stretched appropriately and iced regularly, especially if you are training every day. Icing can also help when you are training 2-3 times a week. Your legs kick and kick and are consistently using those fast twitch muscle fibers. Legs will become fatigued just as much as your shoulders can. Different injuries to the leg can also become problematic. Swimming is a full body workout! You use your core for direction, legs for added propulsion, and shoulders and arms for power. As with any sport, you become more prone to certain injuries. Swimming is no different. 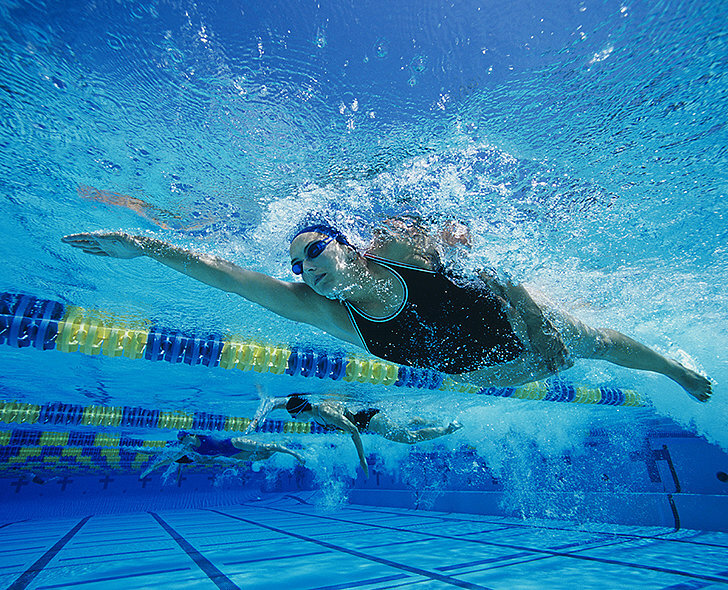 The most common injury for swimmers is a type of tendonitis called Swimmer’s Shoulder. It affects mainly the bicep tendon and one of the rotator cuff muscles, the supraspinatus, because of the repetitive nature of swimming. Depending on which stroke you use, you also open your body to other possible injuries. Breaststroke can stress the MCL, the medial collateral ligament, in the knee or you can develop petellofemoral syndrome, a painful stress on the tendons on the knee and going up the leg. You can stress your elbows or ankles. Prevention is key! Massage is an amazing way to prevent these injuries. Massage also helps reduce the effects of any tendonitis. According to Pain Science, specifically deep friction massage is especially effective for tendonitis. It helps by breaking up the adhesions and fascia that’s too tight around the tendons. You can do friction massage yourself at home. However, doing this at home does not take the place of your massage therapist. Anytime you have a pain in your body, there’s an automatic compensation program that your body embraces. Your massage therapist will help you with the tendonitis as well as other muscles, preventing further development of tendonitis in other areas of the body. Massage will also help decrease likelihood of soreness in all muscles and can help prevent injury. Read more for sports massage and getting the most out of any exercise program through massage.